Almost as soon as I finished my Luggage Tag Quilt, I immediately started pulling fabric for a smaller version, a Christmas Gift Tag Runner. I've been saving Cotton + Steel's adorable Tinsel collection for this year's Christmas sewing, and these prints couldn't be more perfect for this project. 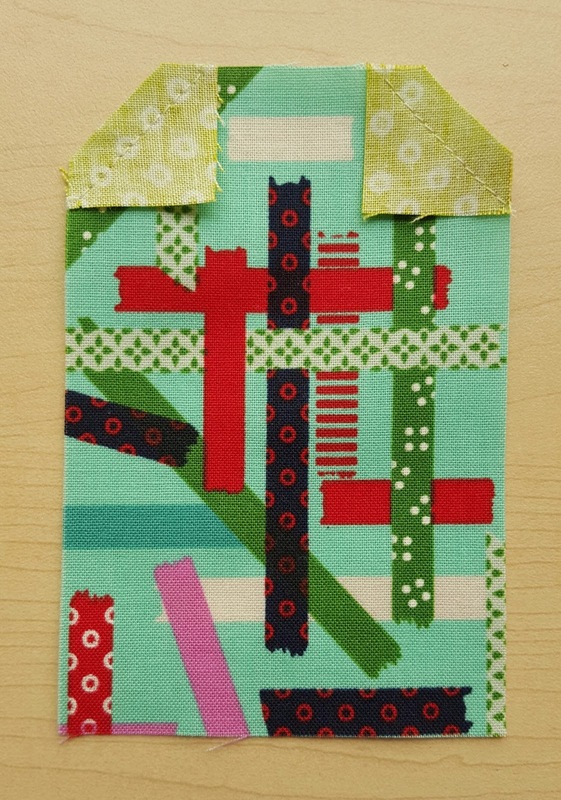 For those of you who might be interested in making a "gift tag" project of your own, I made each of these blocks using one 3 x 4.5" rectangle and two 1" squares. Just place the squares at the top corners of the rectangle (right sides of the fabric together) and sew diagonally across from the outside lower corner of the square to the inside upper corner. Trim the seam allowance and press the seam open. 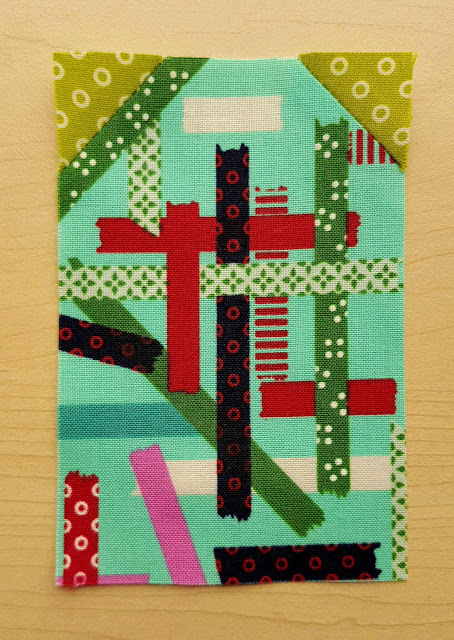 And there you have it...a simple little tag block perfect for projects that feature luggage tags, gift tags, price tags -- you name it! If you make any projects with one of these, be sure to tag me @fabricmutt on Instagram. 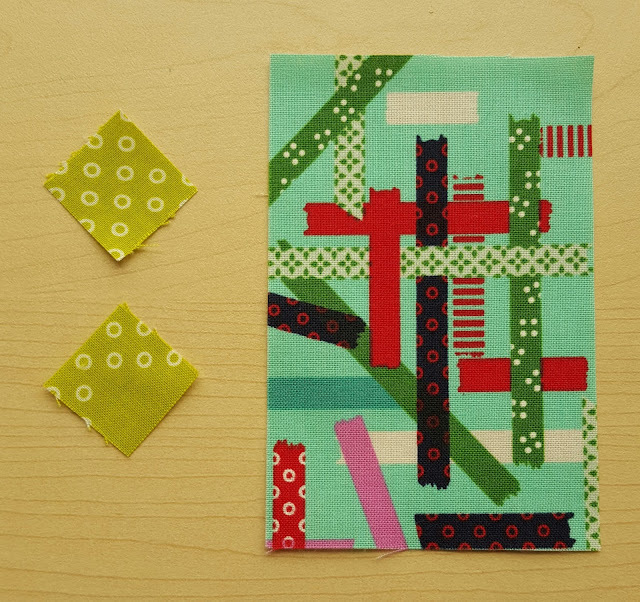 I would have spaced these blocks apart a bit further, but I really wanted to use that lime green fabric for the sashing even though I didn't have much left. 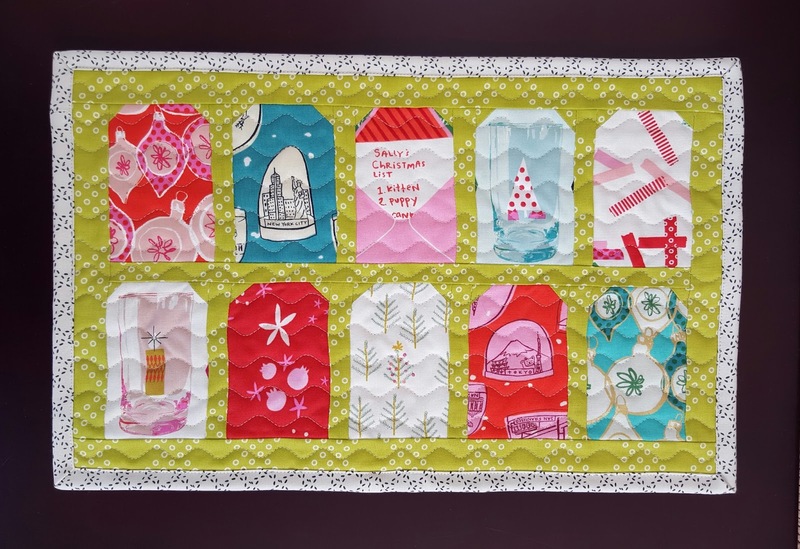 The runner is backed in a Tinsel washi tape print, and I bound it in a Stitched Circles print from Zen Chic's amazing new Modern Background collection. 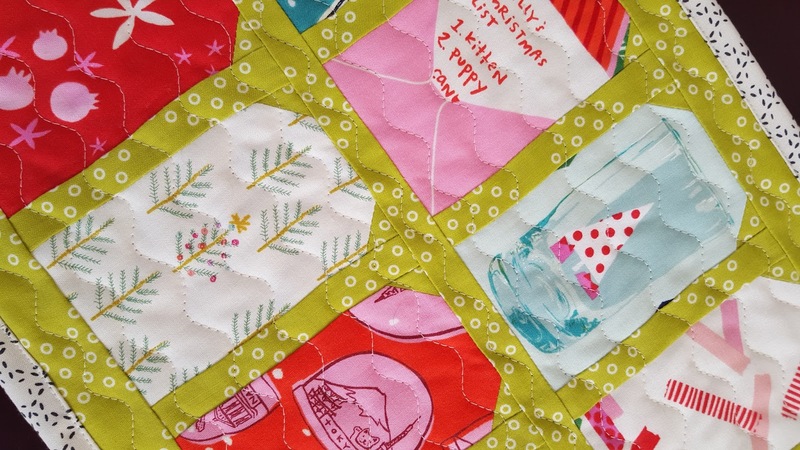 I used my favorite wavy stitch on my sewing machine for the quilting. I don't think I've ever gotten such a head start on my Christmas sewing. It feels amazing to be so ahead of the game...for today anyway! Every now and then I get to test a pattern for a friend, and it's always such an honor. My friend Amber has been turning out a series of unbelievably clever little boxes that are sewn completely by hand using English Paper Piecing methods. I got the chance to test out her new Square Box last week, and I absolutely love how it turned out. My version is slightly smaller than the original pattern, finishing at just 7" square, but it's still very roomy. I didn't have fusible Pellon 71F on hand, but I made do with Pellon Peltex 70 and some adhesive basting spray which worked quite nicely. 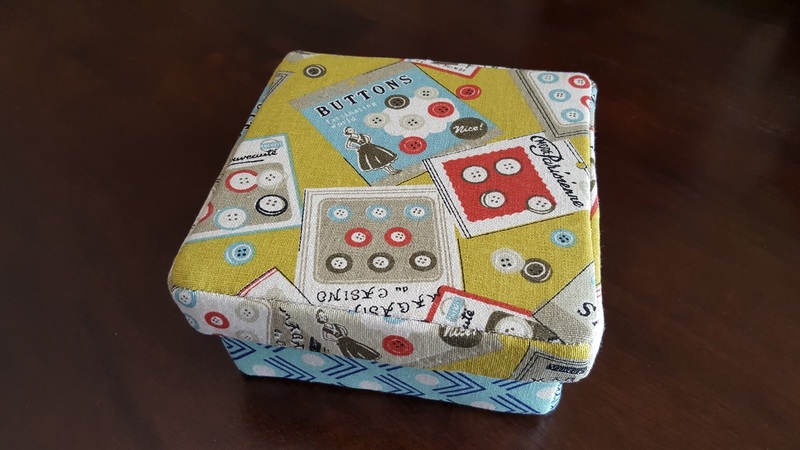 The combination of firm interfacing, hand sewing, and linen fabrics makes this an incredibly sturdy little box. I can tell that it's going to hold up well with use. 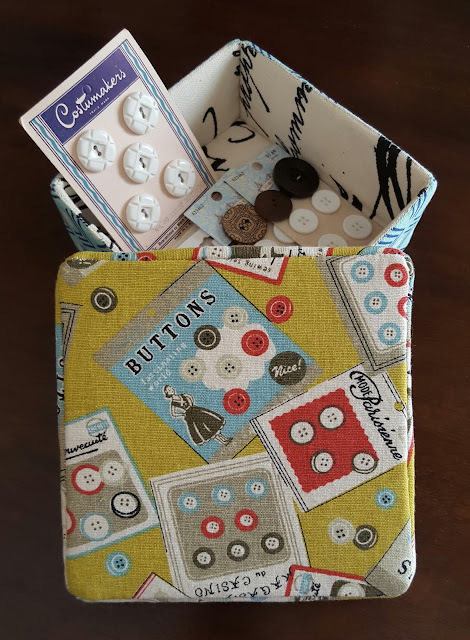 I've been needing a bigger container to hold my button collection, which had outgrown the little tin pail I was using. 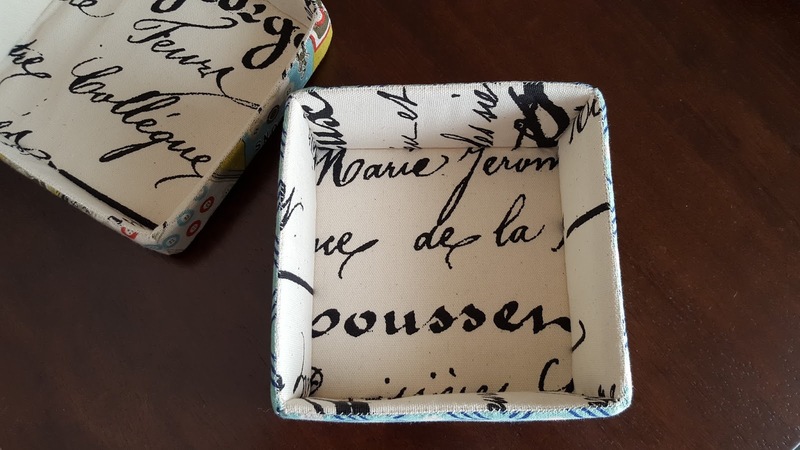 This box not only gives me plenty of space, but it looks just plain adorable sitting on the shelf in my sewing room. Visit Amber's pattern store on Craftsy to make one of your own! Believe it or not, third grade was the first year that I went to school for an entire year in one country. Up until that point, my family was traveling back and forth between Southern California and South America where my dad supervised the building and operation of what was, back then, the largest recording studio in Bolivia. The work was sponsored by a non-profit mission organization started by my great grandfather, and it had a huge impact on our family. My parents often reminisce about how young and naive they were as they jumped into that new adventure with two little girls, my sister so young that she was still wearing diapers. Neither of them spoke Spanish when they first arrived (my dad went through intensive language training for the first few months at a local Catholic school), and they had few people to depend on for help. Friends came from unlikely places. My dad loves to tell the story about how my sister and I spent an evening in the convent after one of the nuns at his school insisted on giving my parents a much needed date night. And every time we passed through Rio de Janiero on our way to Bolivia, a kind cab driver named Umberto was always our guide around the city to tourist spots like the Christo and Sugarloaf Mountain, both of which I absolutely adored. He even saved my life once when I accidentally started across a busy street by myself, pulling me back to the curb before I could be run down by an oncoming car. I have a hundred memories from those days that come back at unexpected times, but somehow it's the smells I remember most: the vinyl and cigarette smoke of taxi cabs, the sausages in the butcher shop, the potatoes in the outdoor market where we bought most of our groceries. I remember that inflation was so bad in those days that the money was worth hardly anything, so my dad had to carry around a briefcase full of bills like a mobster in order to do our weekly shopping. 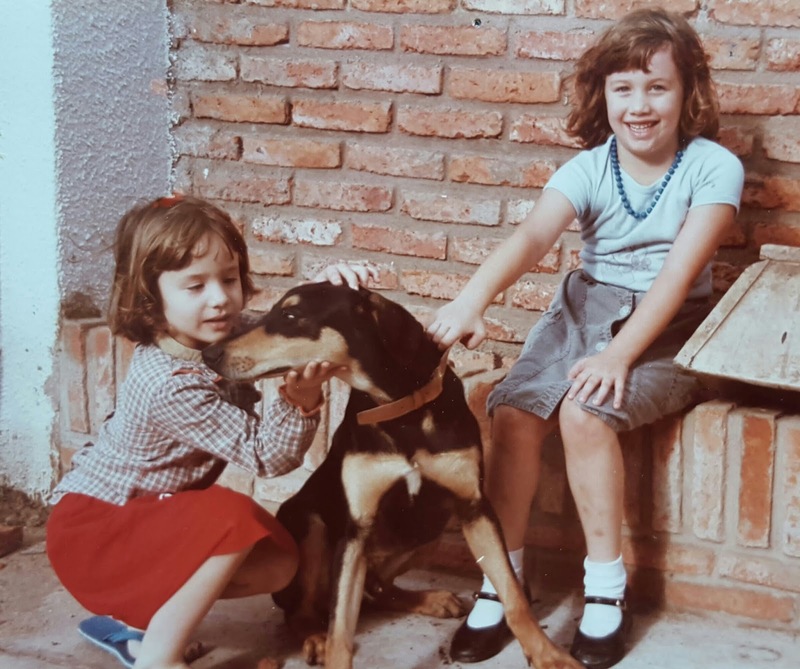 My sister and I went to the local mission school, but it seemed like most of our time was spent in the little apartment that was built into the recording studio building where our family lived. Amy and I rode bicycles, played games, and fell madly in love with reading. I even had my tonsils out at the hospital down there, where the nurses gave me Jello in recovery instead of the ice cream I'd been promised (I always say that I've been trying to make up that ice cream deficit ever since). My parents insist that they were flying by the seat of their pants back then, trying to keep everything going, but I disagree. In their humble earnestness, I saw a daily example of perseverance, courage, faithfulness, and love that made an enormous impression on me as a child. It's one that I strive to follow even now in my own journey as a parent. 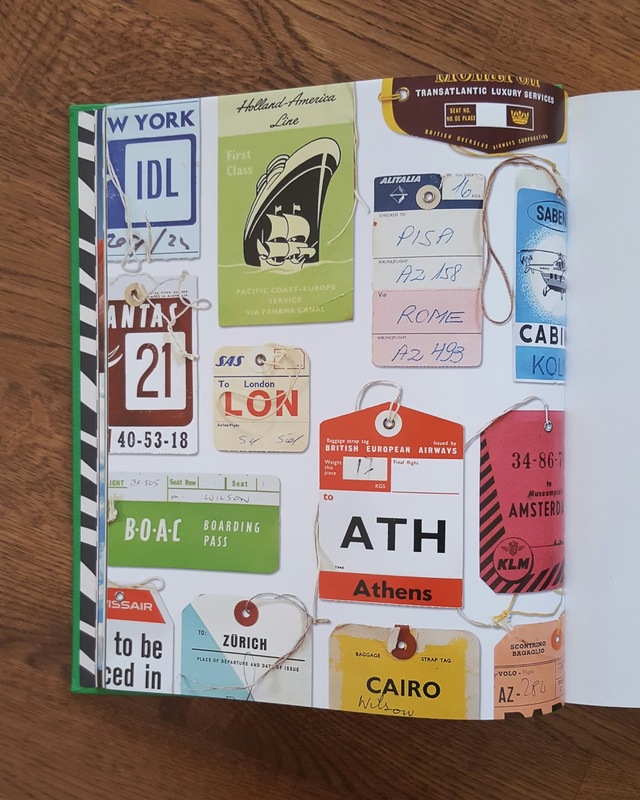 By the time I was eight years old, I had spent more time on a plane than many people do in a lifetime, and to this day, I have a love for all things travel related, particularly vintage travel. So when I spotted Places to Go, People to See by the talented people at Kate Spade, I couldn't resist it. The photo of luggage tags stood out to me above all else -- I was sure there was a quilt in there somewhere. 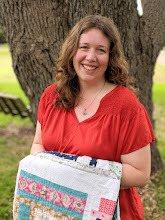 And when I spotted the rainbow Suzuko Koseki bundles at Sew Me a Song, I knew that I had found the perfect fabric to make that quilt a reality. 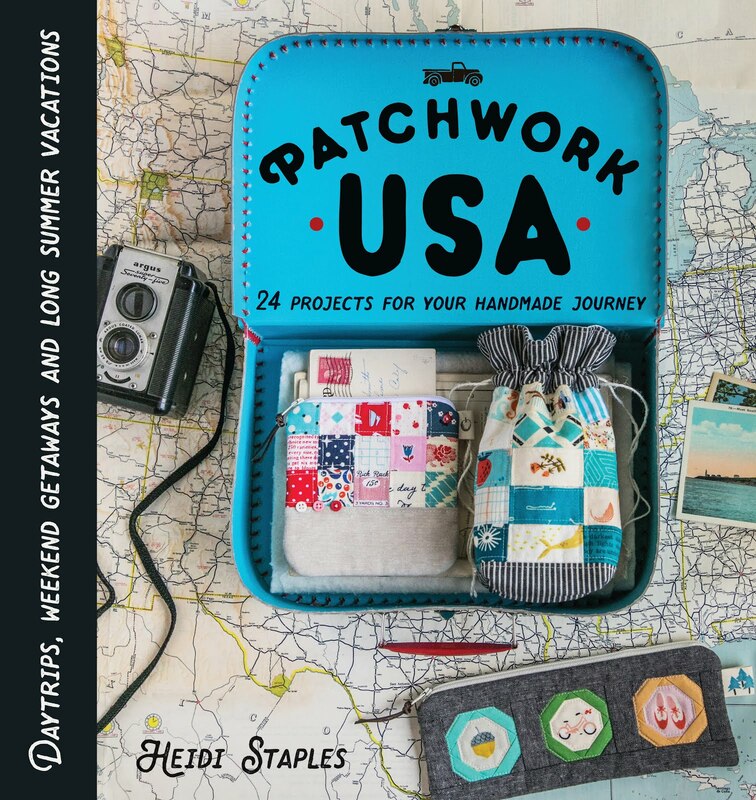 I emailed Becca immediately, asking if she'd let me do a promotional project on my blog, and she was sweet enough to send me this bundle. 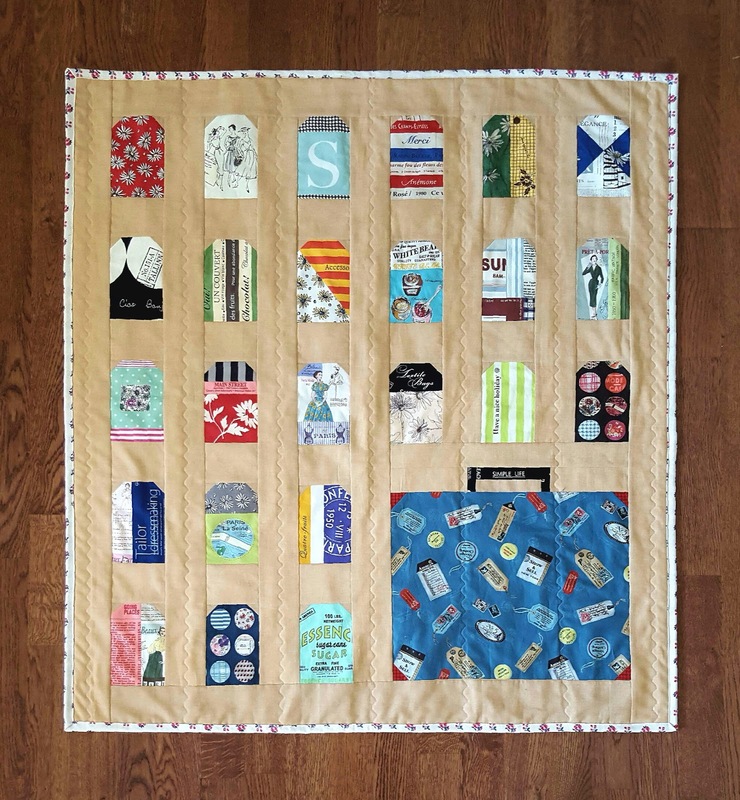 Thus, the Lugguge Tag Quilt was born. It was such fun to make the tag blocks for this quilt simply by sewing diagonally across squares at the top corners of a rectangle. A few of these rectangles are pieced, but mostly I wanted to see how many different designs I could come up with by carefully fussy cutting the prints. I adore Suzuko Koseki's fabrics for their vintage style and originality. Her work has so much personality to it, and I was thrilled to have an entire color spectrum of prints to choose from. 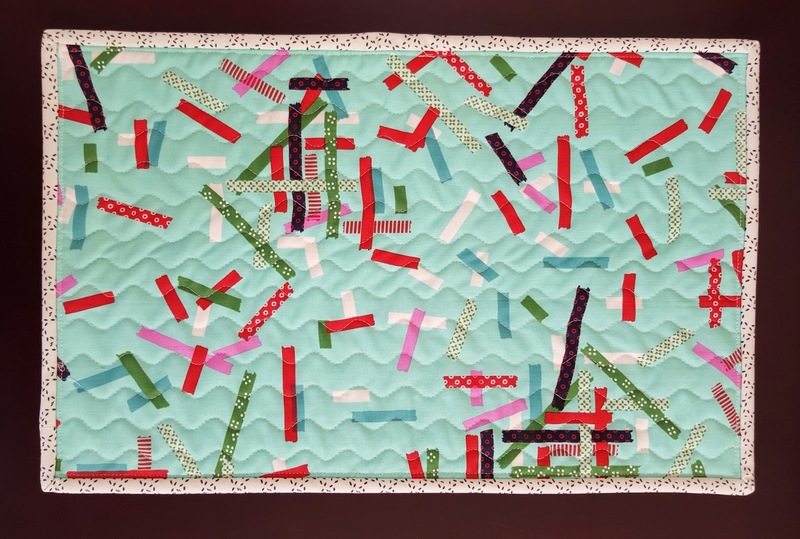 With a little input from my friends on Instagram, I decided to add a suitcase to my quilt as well, using some yardage of another Koseki print that I had on hand. Quilter's Linen adds a bit of texture and makes a nice neutral background. 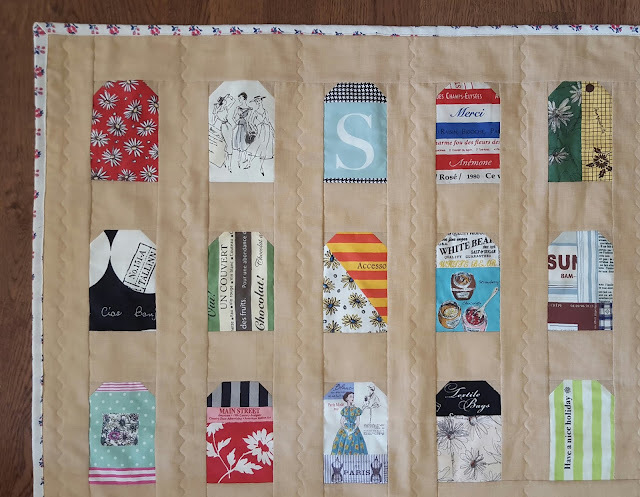 The quilt backing is made entirely of scraps leftover from the original bundle. I sewed pieces together into rows and then sewed the rows together, going in color order as I went. The result is a backing that I love just as much as the front. I quilted wavy lines down the sashing strips and bound the quilt in a pink and navy floral print that I absolutely love to use for binding. 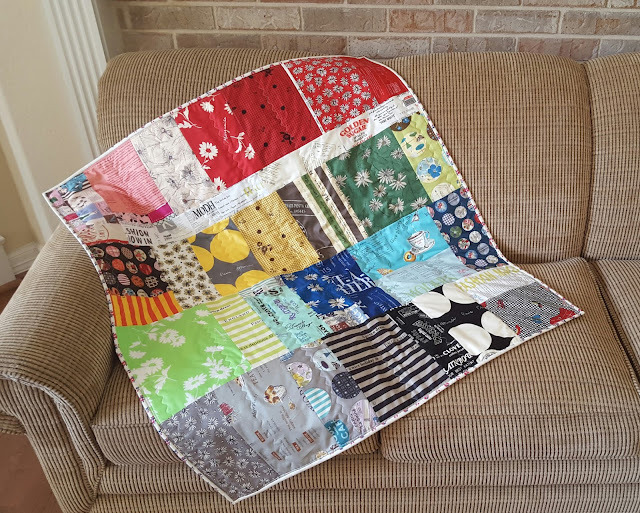 It looks great around just about any patchwork quilt I've held it up to yet. Of course, now that I've started thinking about tags, it occurs to me that a "gift tag" pillow would be absolutely perfect for Christmas. Meanwhile, so many thanks to Becca for letting me play with this gorgeous bundle, and thanks also to my sweet friends on Instagram who were so encouraging as I shared my progress. This lovely little quilt is now draped over the end of our couch in the family room where it will be waiting the next time my youngest daughter comes up to me and says, "Mommy, I'm your cold little Mousie. Can you snuggle me in a quilt?"